Readers, beware! 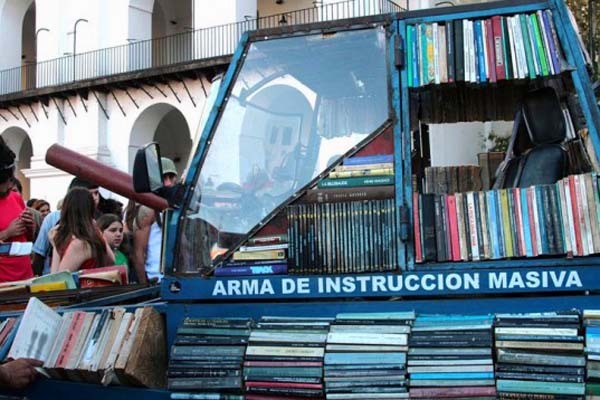 Buenos Aires-based artist Raul Lemesoff is taking over the world with his “Weapon of Mass Instruction”—a bookmobile shaped like a military tank. 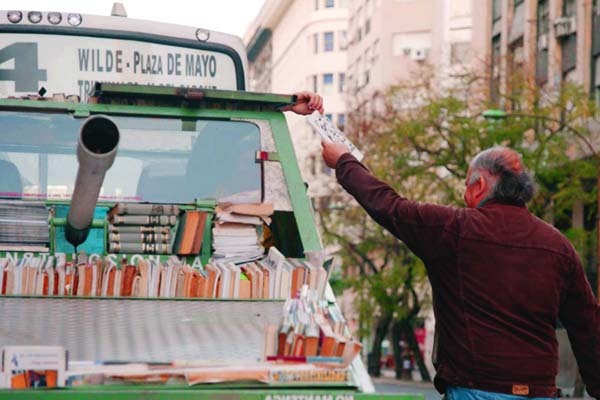 Lemesoff reconfigured a 1979 Ford Falcon into a mobile library and has taken it to the streets of Argentina to promote reading. 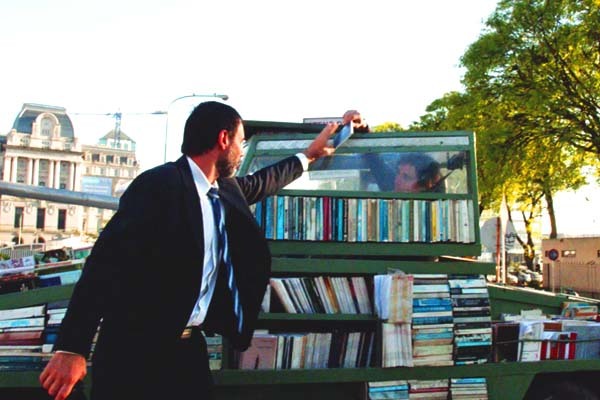 Featuring a fake gun barrel and a rotating upper chamber, the traveling library’s built-in shelves can hold about 900 books spanning multiple genres. Lemesoff gives the novels, biographies, poetry anthologies, non-fiction books, and other tomes for free to anyone who wants one. Known and beloved in his social circles as a well-meaning visionary and eccentric, Lemesoff worked on the tank for several years before unveiling its design. Some of his friends reportedly thought he was working on his car or building a submarine, while others guessed it might be a spaceship. 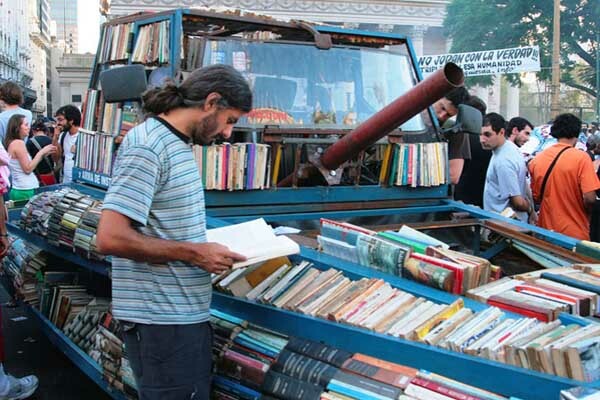 Once revealed to be a mobile library tank, however, Lemesoff quickly gained recognition for his bibliophilic mission. 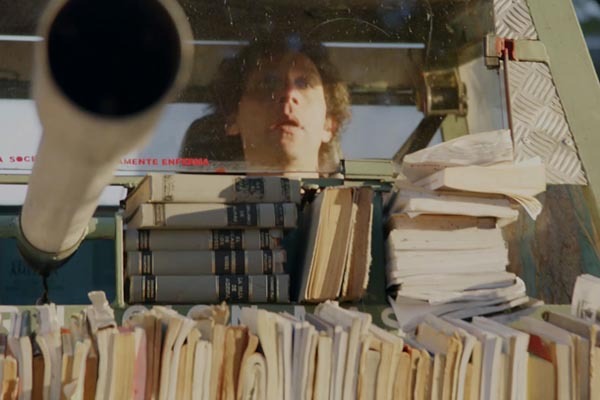 For this year’s World Book Day, beverage brand 7UP featured the artist and his tank in a video as part of its “Feels Good To Be You” campaign, celebrating individuality and uniqueness. In the video, Lemesoff says that his ‘missions’ are “very dangerous” and that he ‘attacks’ people in a “nice and fun way.” He says his primary target is kids (although he gives away books to people of all ages), and makes a point to encourage them to use their imaginations as they read. 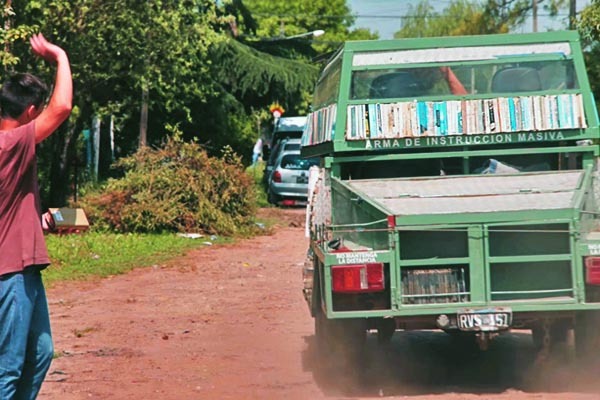 Lemesoff doesn’t drive the bookmobile for fame or money, he says; he just does it because he has fun doing it and likes to make each person he gives a book to promise that they’ll actually read it. What do you think? Will this whimsical, thought-provoking imagery get more people to read, or is this crusade a lost literary cause? One thing’s for sure though—the world definitely needs more inspired, quirky geniuses like Raul Lemesoff. Learn more about him here.